Our 2018 exhibition welcomed over 600 visitors to see work in mosaic, wire, stone, acrylic, oil, watercolour and pastel. Undoubted star of the show was Zella Smith who was awarded not only the Rachel Thomsen prize for Best Watercolour for her painting Lady Ba Ba but also the The People’s Choice prize for her study of an elephant, entitled Close Encounter. The winner is selected by visitors to the exhibition who vote for their favourite artwork and the prize is a beautiful glass apple which the winner keeps for a year. Zella, who has just returned from a trip to Zambia capturing on film more subjects for her paintings, won the prizes at the close of the show - on her birthday. 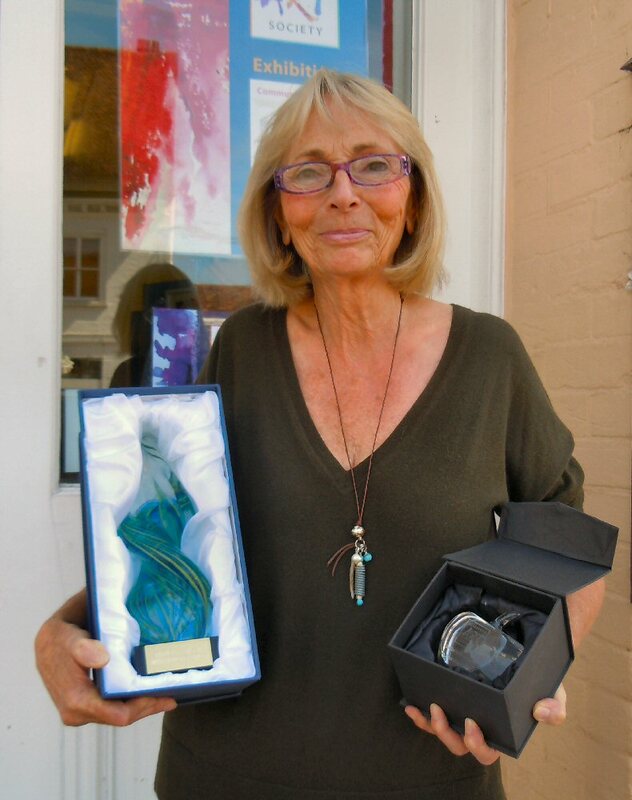 The prize for Best Oil Painting went to Jacqueline Snowdon for her Ramsgate Café; Best Acrylic went to Richard Cox for Bodmin at Alresford, Best 3D exhibit went to Minnie Hughes-Onslow for her Cockerel mosaic and Best New Exhibitor went to Anne Vail for her oil painting Cyclamen. The show was opened by the Mayor of Winchester, with local MP Steve Brine also in attendance (who was celebrating his 15th wedding anniversary with wife Susie) along with Gordon Thoday, the show’s Preview Night sponsor, local estate agent Hellards. Birthday girl Zella Smith with her People’s Choice and Best Watercolour prizes. Preview Night Guests: Exhibition Organisers Zella Smith (left) and Jeannie Packenham (right) with MP Steve Brine, The Mayor of Winchester and Gordon Thoday of Hellards. Rachel Thomsen Best Watercolour prize, Lady Ba Ba, won by Zella Smith. Best Oil Painting, Ramsgate Café by Jacqueline Snowdon.